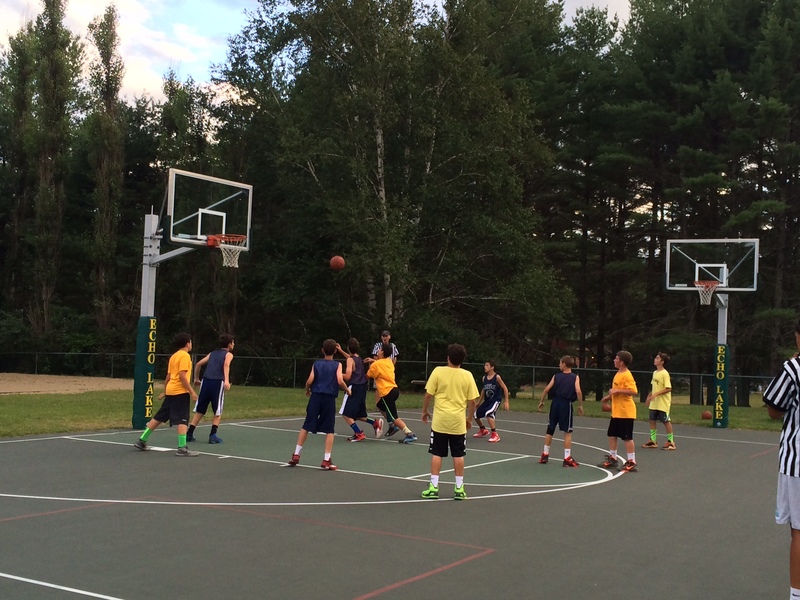 On an cool Adirondack evening, the Lower Village Boys fought a hard battle against Baco in an inter-camp basketball game in Main Village. Our boys jumped out to a fast start and took an early lead, but Baco was able to rally back after a run of their own. The first half ended with the teams nearly deadlocked. After a handful of lead changes, Baco started to pull away a bit when they went into their full-court press, but our boys never quit. They fought hard for every rebound as they banged under the boards. They played a physical defensive game, and even hit a three-pointer late in the game, but it was too little, too late. Throughout the entire game, both teams displayed good sportsmanship. The rest of the camp was busy with their own evening activities, but they lent their support in passing at various points throughout the game. Some of the younger boys sat and watched briefly, while some of the older girls offered up a cheer as they strolled past the court. Main Village was bustling with energy as campers enthusiastically engaged in a scavenger hunt, which culminated in canteen in The Lodge, giving the younger campers a glimpse into their future in Senior Village. We may not have won this inter-camp game, but it was a fun night for all just the same.